Today, like most of the other humans on the planet, I’ll spend it reflecting on the year that was…2017. As I look back on the last 365 days, I think of my triumphs and also disasters in business, family and personal developments. It’s these successes, failures, challenges and learnings that can either bolster up and encourage a business owner or discourage them entirely. As for me and my findings, I’m encouraged as to what 2018 might bring. This time around though, I decided to take a little different path to the New Year. Not for the sake of change itself, but more to appease my science/nerd brain and analyse it by timeframe and category and it’s overall feedback. 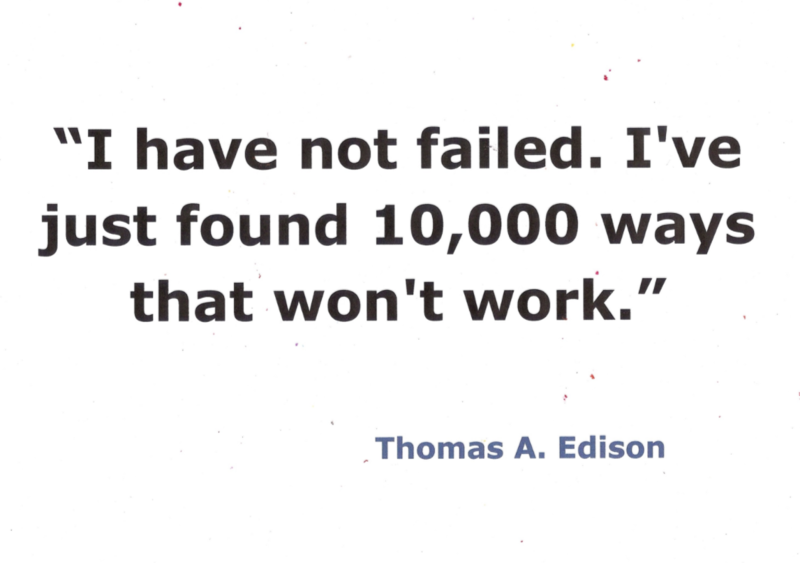 As I was searching for a quote to support my experimental mood, I found this one from Thomas Edison. How true! Overwhelmingly after looking at my 2017 notations, I’ve decided my best chance of success for 2018 is to centre my business, myself and relationships to be more humanistic and I’ll tell you why and what I mean. 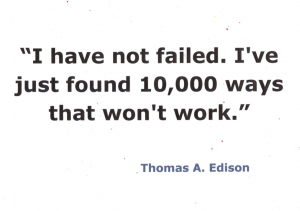 My love for experimenting is very real, however, I’m afraid that the results of my 2017 life experiment aren’t nearly as methodical as Edison’s attitude above. While my inner science nerd knows about actions and reactions, and logically we all know to fail is to learn – somehow you become less objective when it’s you in the experiment. Still, hopefully, you agree that it’s important to look back and identify where you went wrong – learn and move on. Not with the intention of bashing yourself around too much. But, instead, look at the feedback and where you had the wins and where you need to adjust, improve or just get rid of something entirely that isn’t serving you, your business or relationships. So, I set out to discover if there was a theme or a common thread in the successes I’d had in 2017 – if so, why not try to replicate it? First, I started with a simple two column list. The first column I filled with things I’d had success with and the other with the things I’d failed or did not work out as well as I hoped. As I now look down now at my two columns of “Successes” and “Failures”, I get a sense that one side is light, fluffy and oozing with positivity. In fact, if I can use a visualisation of cartoon characters (I feel most things are better with movie associations), then the “successes” column would be characterised by those cute, colourful trolls with the wispy hair and the high-pitched voice in the movie Trolls. On the other hand, I can’t help but think of the “failures” side as more of the Lord Business character from the Lego Movie, evil, selfish and wanting to take over the world with his sacred Kragle. After I get past the Kragle montage with a bit of a giggle, I examined the columns and something interesting finally emerged. This year was notably different from previous years as I finally finished my book – The Retail Experiment. For the first part of the year I was still locked away in my office and the second half I emerged back into society once again. Content took longer than it should have to produce probably because of my foggy brain. My body produced further feedback by gaining a bit of weight in return for my new sedentary lifestyle. Yeaaayyyy! ;-( Just what I need in my mid-forties right?). In general, my disposition was that I had to finish the book before I could move on to the next thing. Therefore invites to networking and even many social engagements had to be turned down. In general, because I’d worked in a corporate environment for so long prior to me starting Retail Rockstars, I found this whole period to be quite lonely. Second Half of Year: On the other hand though, after finalising the book I had been working on for the past three years, I once again emerged from my office and began socialising, working on deals, partnerships and networking again. I’m not sure how you feel about networking, but I like meeting new people and hearing about their businesses. It always inspires me when I hear good business stories, and it causes me to think about how I might utilise that same angle to help retailers or apply similar strategies in my business, Retail Rockstars. In all fairness and disclosure, most of this was brought about by my; A) hard work to finish the book in the office, to begin with, and B) my innate need for human connection (we all have this). And it may seem strange to have this ‘revelation’ given that I have written a whole chapter (in my book) about in-store Humanics in retailing –and how important it is to add more personality from yourself, your staff and local trusted experts to create a more in-depth connection with your customers. Somehow though – regardless of the success of humanics in my previous retail store, experiments that worked and researching and writing about the subject. Somehow I failed to make those adjustments to my personal life and my business. Instead, I felt the need as a budding entrepreneur to pump out more digital assets from my office chair. As I now look down my bubble-gum, “Troll-esque” list, it’s littered with items that would have never happened without face-to-face meetings, networking with new and fantastic business contacts I’ve met. I was lucky to join several entrepreneur groups and also found the time to spend more quality and mindful time with family and mentors. So, in 2018 I’m committing myself to becoming more human-centred, by that I mean I’ll be looking at all opportunities and challenges through a humanistic lens. I’ll be interacting with more people face-to-face, helping or mentoring others. Any “new 2018 projects” will have a prerequisite for connecting myself or other people together. 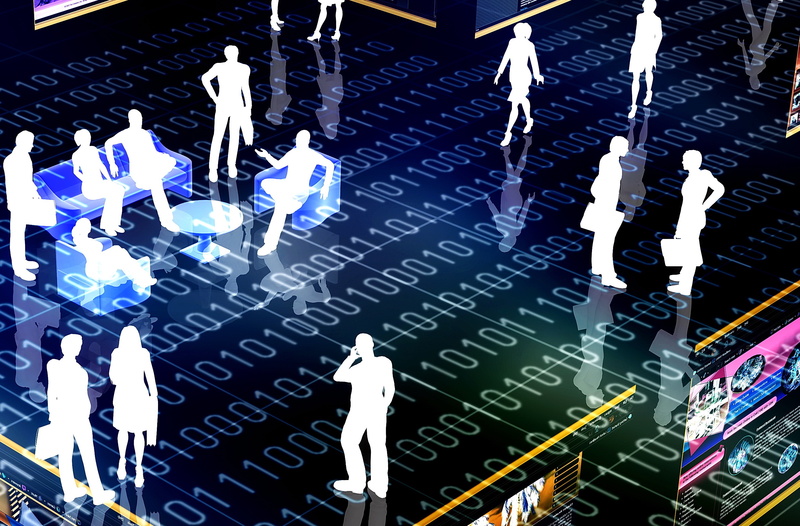 Specifically looking at connecting retailers, their staff and customers to a common cause. How can I help retailers more efficiently, how can I personally communicate better with them and their customers? I’ll be spending more time speaking at events and attending events. Finally, also looking after my own human needs of getting out of the office and being more active again. I wonder if meeting with more people and focusing on humankind resonates with you? I’m not sure what lies ahead in retail in 2018, but based on my skills and what I’ve experienced in 2017, I’ve seen better quality and faster results when I focus more on people and less on the next big thing or technology solution. If you’ve already written your list of 2017 reflections, I’d love to know how you went about it this time around. Better yet, share your reflections for 2017 and tell us how you got there. Please share your ideas, methods or techniques in the comments below – ya never know it just might help out another human! Links to Book (Print): Amazon Booktopia Barns & Noble My Website or Book Retailers in Australia like: Dymocks & QBD and many more.